Position: full sun Soil: well-drained, moderately fertile, neutral to acidic soil Rate of growth: average Flowering period: May and June Flower colour: gold and mahogany Other features: all parts of the plant may cause severe discomfort if ingested Hardiness: fully hardy A sultry iris with gold and mahogany flowers that are held on tall, ramrod-stiff stems. 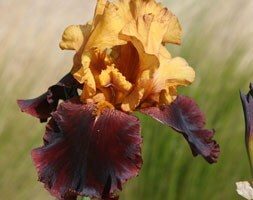 A magnificent bearded iris that looks superb planted with rust and chocolate coloured flowers. Great for planting in bold groups in full sun and well-drained soil. Like all irises, it is worth preparing the soil before planting by adding plenty of well rotted manure or good garden compost to provide nitrogen and other nutrients. Garden Care: Plant shallowly with the upper part of the rhizome sitting on the surface of the soil, incorporating a low nitrogen fertiliser in the planting hole. After planting remove the upper-most third of the leaves to protect against wind-rock. In exposed areas stake with bamboo canes in early spring. Divide and replant about every three years.